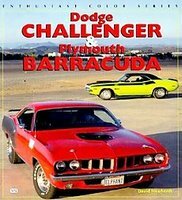 Plymouth Barracuda car books include the development and restoration of the Barracuda. The Plymouth Barracuda was manufactured by the Plymouth division of the Chrysler Corporation from 1964 through to 1974. Barracuda Muscle Portfolio 1964-1974 by R M Clarke (2003). Although the Barracuda was introduced a few weeks before the Mustang in 1964 the earlier models lacked muscle. The 273 helped sales but not for long and in 1967 Plymouth redesigned the car and the engine options included the 383. The 1967 sales figures, however, would never be equalled. For 1969 buyers could have the 440 V8 and body styling was again changed. Despite this and a limited incursion into racing the sales slide could not be halted. As with all other muscle cars the early 1970s emissions and safety regulations killed them off. 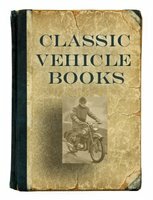 This is a book of contemporary road and comparison tests, specification and technical data, driver's impressions, new model introductions and history. 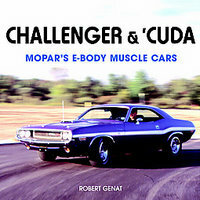 Challenger & 'Cuda: Mopar's E-Body Muscle Cars by Robert Genat (2005). Chrysler entered the pony-car market with the capable but unlovely Barracuda in the early 1960s. The car was refined over the years, becoming a true muscle car, and a rather handsome one at that, but it wasn't until the advent of the E-body pony cars from 1970-1974 Barracudas, the Dodge Challenger and Plymouth 'Cuda that Chrysler became a true player in the pony-car market. 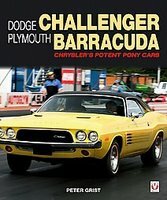 This book tells the story of Chrysler's pony car series, from the advent of the original Barracuda in 1964 to the final days of the smog-motored Challengers and 'Cudas of the mid-1970s, focusing on the series heyday in the early 1970s. Dodge Challenger And Plymouth Barracuda by Peter Grist (2009). Featuring every series and model of pony car made by the Chrysler Corporation in the 1960s and 70s, including the slippery Barracuda and classic Dodge Challenger, along with stars of the big screen and drag strip. An in-depth look at the very desirable pony cars from Plymouth and Dodge that managed to beat the Ford Mustang to the dealerships and went on to become one of the most sought after classic cars of all time. Challenger & Barracuda Restoration Guide 1967 - 1974 by Paul Herd (1997) contains hundreds of detailed photos, factory illustrations and helpful data tables covering everything from decoding VIN tags to applying the correct finish to virtually every part on your car. All the information you'll ever need to authentically restore your monster-engine musclecar to show-winning perfection! 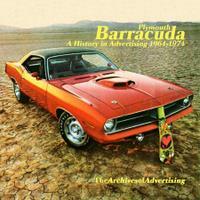 Plymouth Barracuda: A History In Advertising 1964-1974 by William McBride (2001) CD ROM. Beating the Mustang to the showroom wasn't enough to make the Barracuda THE sporty car of the 1960s, but by the time the Hemi-Cuda rolled out in 1970, every Mustang, Camaro, Firebird and Javelin feared for their pink slips. This CD-ROM contains a browsable collection of ads carefully scanned from original magazines and newspapers. Dodge Challenger & Plymouth Barracuda by David Newhardt (2000). Modern colour photos of the finest Barracudas and Challengers in existence are accompanied by the cars design and production histories. 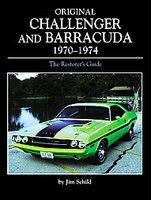 Original Challenger & Barracuda 1970-1974: The Restorer's Guide by Jim Schild (2003) will demonstrate the correct parts, finishes, options and trim pieces for all the versions of the E-body Dodge Challenger and Plymouth Barracuda, which appeared from 1970 to 1974. Especially important to this are the variety of engine options available, including the hemispherical-head engines - Hemis - that are so crucial to the mystique of these muscle cars. Barracuda Challenger: A Source Book by Samuel Shields (1983) covers the whole story, from the original Barracuda in 1964 to the last of the line in 1974. All models are covered including the exciting Formula S and 'Cuda models. The Dodge Challenger is also included from 1970 to 1974, as are rare Barracuda show cars. 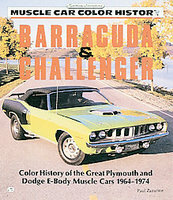 Barracuda & Challenger Color History Of The Great Plymouth And Dodge E-Body Musclecars 1964-1974 by Zazarine (1991). Cudas and Challengers were the hottest thing going in the '60s and early '70s. See how they got there, what made them the huge success that they were, and why they're now two of the most collectible musclecars around. Testing, early designs, racing, dragsters and street cars, plus all the facts and specs you expect.